Now that the arms are in place I've added the shoulder pads. I then used GS to fill the gaps at the bottom of the pads to create an Mk VI style shoulder pad. Alternatively before adding the shoulder pad to the model I could have used thin plasticard strips, one over the top edge of the pad and one around the bottom to create a Mk IV style shoulder trim. I've also left the crux terminatus on the left shoulder because in this example I want to use him as a veteran marine. For regular marines it's best to trim this off and smooth the area over . Although I still need to clean up the greaves (lower leg armour) and finish the boots on this guy that's pretty much it finished. If anyone has any further questions then feel free to post them here or PM me and I'll see how I can clarify areas or offer advice. Wow, over two years in the making, this tutorial is finally finished. I am in awe, Great job Doghouse! Your method requires a bit more green stuff then I had hopped, but I will try your method some day. Can you recommend a good source for buying larger quantities of green stuff then GW? I really enjoyed your video tutorial you did a while back, could you make another one? Your first video really helped me build my confidence with green stuff . Thanks again Doghouse, your work is amazing! Edit: You don't happen to have an army of these guys yet do you? Edited by Gamelli Streamfisher, 29 April 2010 - 01:59 AM. Don't worry I will be continuing this tutorial showing other methods of building them as soon as I get the chance. I need to go back and put the tutorial into some sort of order that makes more sense because I changed the method of making the torso half way through because I figured out an easier way of doing them. 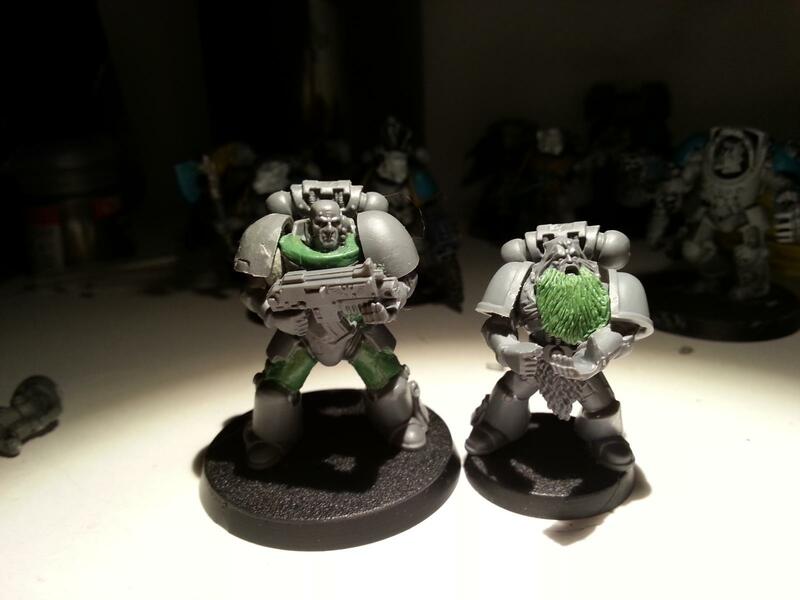 There are a couple of short cuts I've figured out for example with the shoulder pads you can just remove the bit that sticks out on the bottom edge of the shoulder pads, rather than GSing regular marine arms you can use terminator arms from either the loyalist marines or chaos marines and just add regular tactical marine hands, etc. So what I'll do is now that there is enough here to build them I'll put together mini-guides for those not confident with GS. I'm glad the vids helped and I may do some more at some point but can't remember how I converted the file to an MP3 file. As soon as I figure it out I'll give it a bash again as I'd ideally like to do a start to finish video for building these guys. Edit: For GS try heresyminiatures.co.uk, MUCH cheaper than GW and you get loads. I personally like the tube versions they do, fantastic value for money. Edited by Doghouse, 29 April 2010 - 12:38 PM. After some major brainstorming I've worked out a way that people can make these with a minimum of green stuff work. It won't look exactly like the heavily sculpted ones but will be simple enough that anyone of any skill level can make them. Technically speaking it's so simple you could actually use this method with no GS work but at the bare minimum I'd suggest GS the legs to complete the look. I'll got a few things to sort out but will begin posting the tutorial asap. How to build an Actual Scale Marine without Green Stuff. I've boiled this down to the simplest method of building an Actual Scale marine possible. Using this as a starting point you can if you wish quickly build a force of Actual Scale marines with little or no green stuff or use this as the base from which you can sculpt details on. First off you need a box of assault terminators, five rear halves of the regular marine torso and five sets of arms and weapons. Taking a strip of plasticard you can either cut two pieces to fit the soles of the feet or as seen below glue the model to a strip and cut around it to fit. Take the rear half of the marine torso and remove cut away the neck piece that the sticks out in the middle so that it is flat with the sides and glue it to the legs. Next take the terminator breatplate and remove the arch that goes over the head. Next trim the back of the breastplate removing the little nubs making it as flat as possible then glue it to the rear as shown below. One the terminator assault weapons sprue there are little armoured plates. Take one of these plates and stick it over the gap in the from of the abdomen. This is a bit of a rush job but you can trim it to fit the gap if need be. Next you take the arms which in this case are regular marine arms but you can use terminator arms for this if you want a little more bulk and stick them to the torso. Next take the terminator shoulder pads and at the bottom on the shoulder pad on the right you can see a little bit that sticks out. Cut this off as seen on the one on the left and remove the crux terminatus on the the left pad. Glue the pads on, but stick them so that the little rectangular shape is on the back. So basically you swap them over so that the left shoulder pad is on the right and vice versa. I've left the terminator badge on this one to show you what I mean. That's it you're done. You can go back and fill in the legs, fill in the back of the torso, or just leave it as is. I like your approach with the arms, I was thinking of resculpting the terminator arms to be more accurately power armour, but I may try your approach in future. Looks good. "They recruit them when they're twelve, thirteen, fourteen, with all that hate and that arrogance, just at the age you think you're bulletproof and nothing can kill you. Then they keep them like that..."
Thanks mate. It is a lot easier than mucking about with terminator arms and gives you a much wider variety of poses and weapons options. "Never forget, getting tackled by a charging Marine is a LOT like getting hit with a VW Beetle at 30+mph. A VW that hates you and everything you stand for..."
Yeah, the cheapest way of doing it is to use AoBR terminators removing the terminator torso completely and replace the stomach plate with a bit of plasticard instead. By using them and buying marine torsos, bolters and arms from the likes of ebay you can make them for about four pounds twenty. Might take a bit more cutting but worth the effort. Edited by Doghouse, 15 May 2010 - 01:05 PM. Canis Domus = literally "Dog house"
I think i'm gonna do a true scale Legion of the damned squad in honor of their new introduction into the codex. I'll even name the sergeant after you (though Sergeant Doghouse would kinda be awkward to explain to the guys at the bunker). Can't decide if I'm going to stick with the regular arms or beef them up, or if I should use the Terminator arms and mod them. This is my first attempt at a True Scale model. Thanks Doghouse for the awesome tutorial. 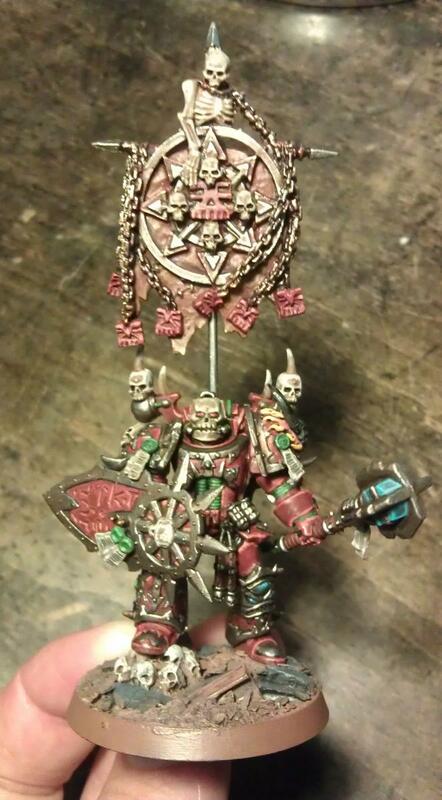 Behold, Bucephalus, Skull Champion of the Word Bearers Legion XXIV Chapter, the Heirs of True Faith. That's right, he's named after Alexander the Great's warhorse. Edited by Augustus b'Raass, 28 August 2012 - 05:47 PM. the non-gs version as that is closer to my current modeling skill. and your work will certainly serve as inspiration as I work on my own model. 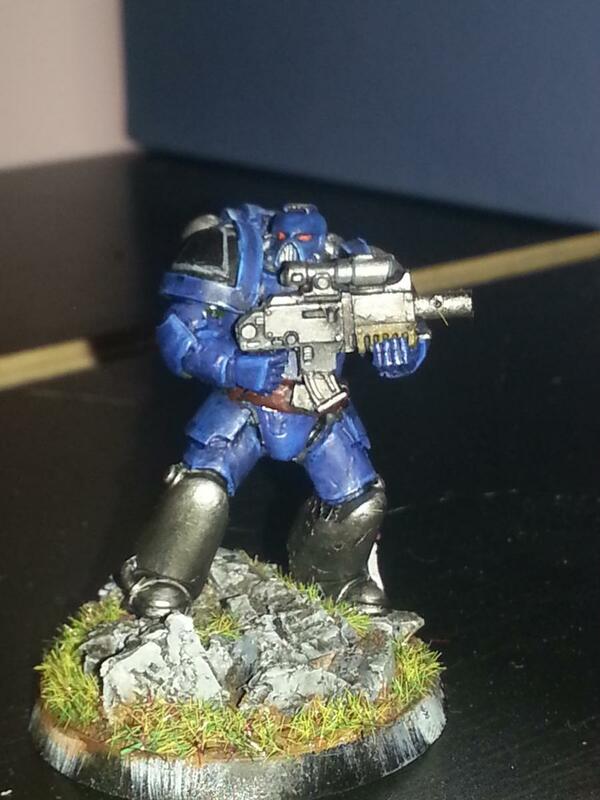 Been a while since I popped into this thread and am extremely impressed by the models that have been posted here, it's fantastic to see what people can do with truescale marines. Ethzor: Fantastic work mate, really nice GS work and the painted guy looks brilliant. Augustus b'Raass: Superb work again, extremely nice model and glad to see that you went with the Word Bearers. I heard you are back, so I am asking for your advice. Inspired by Flint and Brother Heinrich, the whole Night Lords community is pulling together with a roll-call and an official Legion-wide gallery. You do play Night Lords, so you should be there mate! Seeing as I based my True Scale Word Bearer Khorne Champion on your tutorial, I feel compelled to ask your advice/permission: should/may I repaint this dude into a Night Lords Chaplain/Dark Apostle? So it is 2015 and I am wantiing to do a true scale marine project is there any new true scale info out there? This thread has everything you need buddy!